I added oil to the pistachio grinds to wet the mixture and enable it to stick to the salmon. To get it to stay even better, do and I say and not as I do. I cut the salmon into individual fillets (portions) before crusting and baking. This DOES NOT WORK WELL. So I tried to undo the damage by pushing the fillets together and pretending they had not been cut. It somewhat saved the crust. However, what is BETTER is if you can use a whole salmon and cut portions out after baking. Ooops on my part. Next time I’ll smarter. Grind pistachios in food processor until finely chopped; do not let it grind so long that it makes powder. The chunks of pistachio are what lend crunch to the fish. Mix in bowl with olive oil, 1 tsp salt, 1/2 tsp pepper, garlic 1/8 tsp garlic powder, and 1/8 tsp onion powder. Stir until combined. Mixture should be damp but not overly wet. Pat salmon dry (important step because it enables the crust and seasoning to stick). Rub evenly with remaining salt, pepper, garlic powder, and onion powder. Place on baking sheet. Press pistachio mixture onto salmon flesh, ensuring the mixture coats evenly and completely. 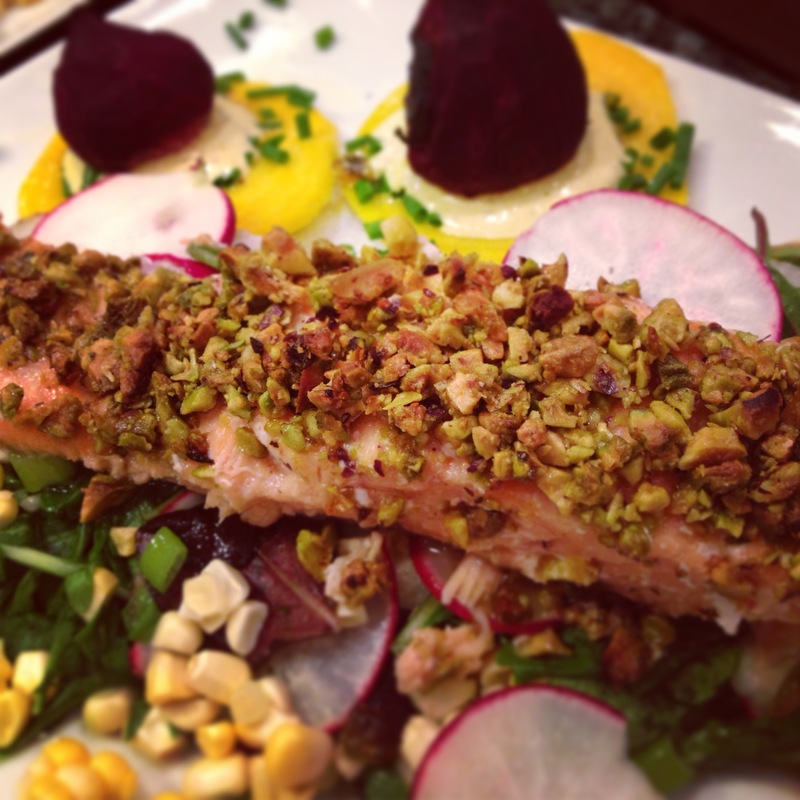 Bake for 10-15 minutes, or until pistachios are toasted and salmon is cooked to your liking. Trick: If you resist the urge to use non-stick cooking spray (aka PAM) and instead cover baking sheet with aluminum foil, the salmon skin will stick to the foil and peel effortlessly off when serving. Using foil will also speed the cleaning process.